New paradigms and the responses to them follow 3 types of vectors. The characters in Galaxy Quest took the vector of the Paradigm Adapter- they go with the paradigm shift (not having much choice) and take on the roles in real life of the characters they had played in the television series. 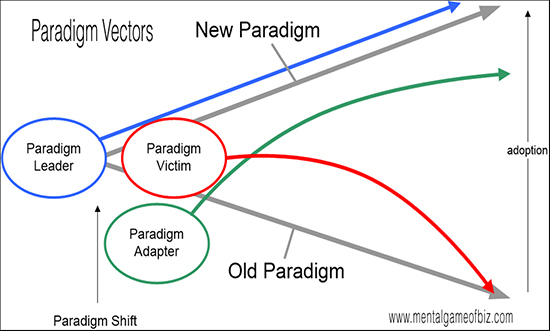 A Paradigm Adapter, one of the 3 Paradigm Vectors, perceives a paradigm shift and adjusts to it. A Paradigm Leader initiates a new paradigm, either inventing it or bringing it into a new context, and rides the vector of the new paradigm coming in like a surfer on a wave. A Paradigm Victim stays stuck in the old paradigm, left in the past and minimized. The plight of Borders bookstores, left behind in a declining business model as Paradigm Leader Amazon introduced the Kindle e-reader and Paradigm Adapter Barnes and Noble offered with the Nook, is demonstrates this paradigm paralysis. Paradigm Leader: Sets a new paradigm in motion. 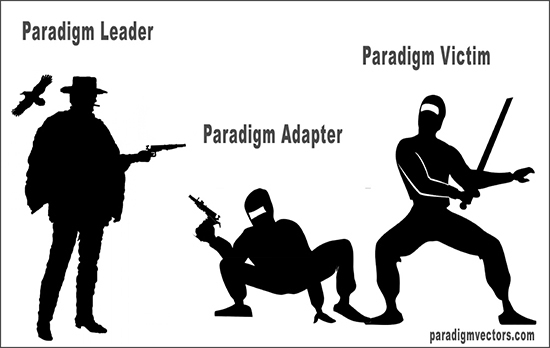 Paradigm Adapter: Perceives the new paradigm, adapts to it. Paradigm Victim: Stays stuck in the old paradigm. During and after the American Revolution, 80,000 Loyalists to the British throne, now labeled as traitors, left for Canada or Britain. And, as usual, the victors wrote the ensuing history books. They defined the paradigm "revere the patriots of liberty" for US schoolchildren for generations to come. The patriots created the incoming paradigm while the loyalists clung to the old one. Had things gone the other way, the founding fathers could have been the ones fleeing as traitors. Today they might be branded terrorists. Fortunately for them, they chose the right paradigm. There can be a lot at stake when a paradigm shifts. Paradigm shifts can come from an outside point of view. 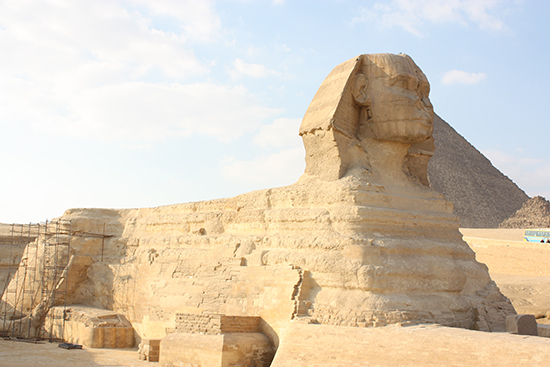 For some time, the accepted view in Egyptology was that the Great Sphinx of Giza was built by the Pharaoh Khafra around 2500 BC. Then, around 1989, American geologist Robert Schoch of Boston University made a strong case that there was erosion that couldn't have come from anything other than extended, heavy rainfall. The trouble is, there hasn't been that kind of rain in the Giza area for thousands of years prior to the accepted beginning of dynastic Egypt in 3500 BC. Egyptologists said that was impossible, as there was no civilization at that time capable of making monuments of that scale. Who would have built it? 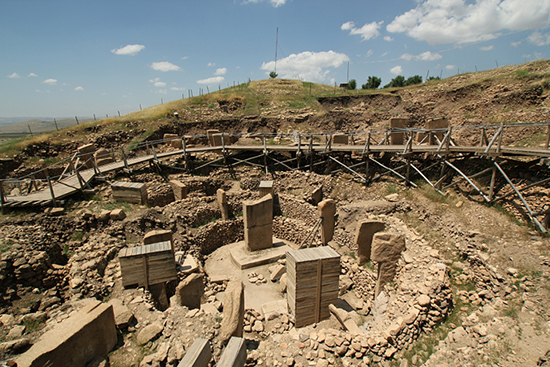 Then, Gobekli Tepe was discovered in Turkey in the 1990s. Full of beautifully sculpted, 3- to 6-meter tall, T-shaped , the site has been authoritatively dated to 11,600 BC. Egyptology seems to be sticking to their story as the world goes "hmmmm." The field of geology challenged an accepted paradigm in the field of archaeology. Old paradigms can die hard as the world goes by. Switching time frames to more recent events, let's consider some modern examples of paradigm shifts, their leaders, adapters, and victims.